The Chandelier Room stage is home to so much talent this Saturday night, we’ve had to add some special reinforcing struts to withstand the awesomeness. But don’t worry, we can handle it – you just sit back, relax, and watch the amazing music from the comfort of our couches, wine glass in hand, a delicious tapas plate primed for leisurely grazing. This is the life! Lily and King (jazz/blues/soul): Mega duo Lily and King are red-hot at the moment and in massive demand on stages right across Australia. These two masterful musicians create rousingly catchy songs and radiate a soulful kind of magic. 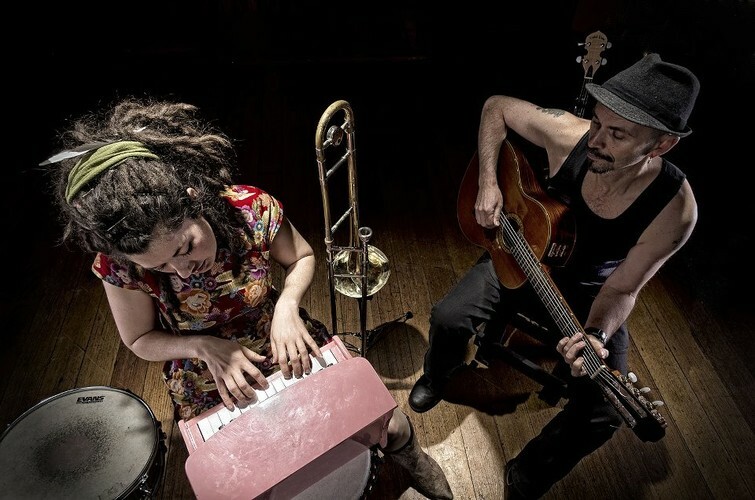 A set by Lily and King sits somewhere between a captivating ’40s nightclub routine and the raw, rambunctious spirit of New Orleans street buskers – a truly wild and joyful experience! Brooke Taylor (blues/pop): Brooke’s a sure-fire favourite here at The Chandelier Room, a local gal who writes some of the catchiest and most emotionally stirring tunes you’ll hear. Her bittersweet songcraft and characteristic honeyed vocal tone win over everyone who hears her. Magnificent. Tim Walker (pop/folk/indie): Tim Walker has received plaudits aplenty in his native New Zealand and now calls Melbourne home. In 2012, he won the MusicOz International Artist of the Year and launched his latest album to a sold-out crowd. His sparklingly beautiful songs speak for themselves, so make sure you come early to catch Tim in action.